World-renowned raw food chefs Matt and Janabai Amsden have been at the center of Los Angeles’ vibrant health food community for more than a decade. Through their café, Euphoria Loves RAWvolution (ELR), they help to nourish bodies, minds, and souls through endless bowls of Superfood Soup, progressive ideas, and community. ELR has become a guiding light in the pure food revolution, a place where people come together, learn from one another, and build relationships around health, consciousness, responsibility, compassion, and joy—all while eating delicious, unprocessed food. 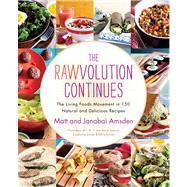 With The RAWvolution Continues Matt and Janabai welcome home chefs everywhere to this wholesome, healthful feast. Featuring more than 150 mouthwatering recipes for shakes, drinks, elixirs, appetizers, soups, entrees, and desserts, The RAWvolution Continues guides you through simple steps to creating fare that is truly natural and truly delicious. Cherry Cream Parfaits. There’s also a section on making raw basics like cream cheese, corn chips, and chocolate, as well as sample menus with creative suggestions on how to pull it all together. The RAWvolution Continues is one of the most comprehensive raw cookbooks available, with family-friendly resources like easy recipes for kids and tips on traveling raw—all with gorgeous color photographs by Andrea Gómez Romero. The RAWvolution isn’t just about changing how you eat—it’s about changing how you live. Perfect for vegetarians, vegans, people who care about the environment, DIYers, and anyone with lactose or gluten intolerance, The RAWvolution Continues is a manifesto for clean living, a guide to recharging your system, and an invitation to join the hundreds of thousands of people all over the world who are ready to eat well.